Last Chance - Lock in this price now! “Quik-Skim”® Venturi-Powered Skimmer, Enhances skimming efficiency by 40%. "Just had our pool completed and the entire process was much faster than anticipated. We were not pressured to upgrade from the package we desired, which was refreshing. All the trades were very skilled and efficient. We love our Pool." 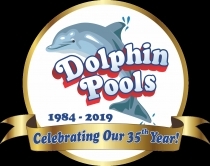 ~ Fred S.
"Dolphin Pools – More than just a company that “builds a pool and says “enjoy”! This has been such a great experience in the entire process. My wife and I met many of the sales staff at a Home and Garden a few years ago, including Kimble, who became our sales consultant for the pool/deck design. We live in central Arizona and it’s not always easy getting to the valley efficiently, so Kimble was more than kind to come to our location to work on a design. Showed an amazing 3D rendering, print out pages needed, and designed with our assistance too! Price was better than any of the other 2 or 3 pool companies that we also considered…and we got a LOT more! Les, Melanie, Barb and Tanya were all wonderful in assisting through the entire project." "We hired Dolphin Pools to design a pool for our backyard in April 2013. From sales to service, the people at Dolphin pools were absolutely amazing. Our sales representative created an affordable unique design for our pool and went over all of the options for equipment and interior finish. The process was very smooth. Our pool was ready to swim in 5 weeks. Each step of the process was very smooth and we were always informed. The back office staffs that coordinate all of the different steps were phenomenal. Even after the pool was completed, there were a few odds and ends that needed to be fixed. The service staff was prompt and completed these tasks. We have recommended Dolphin Pools to several people. We had an amazing experience." Build Your Next Pool And Save Thousands! Learn more about our Signature Package Sale!